SUBSCRIBE AND RECEIVE MY HEALTHY KETO MUG CAKES eCOOKBOOK FREE >> I’M IN! This post may contain affiliate links. Please read my full disclosures here. 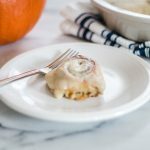 These Keto Cinnamon Rolls are made with my easier, coconut flour fathead dough. 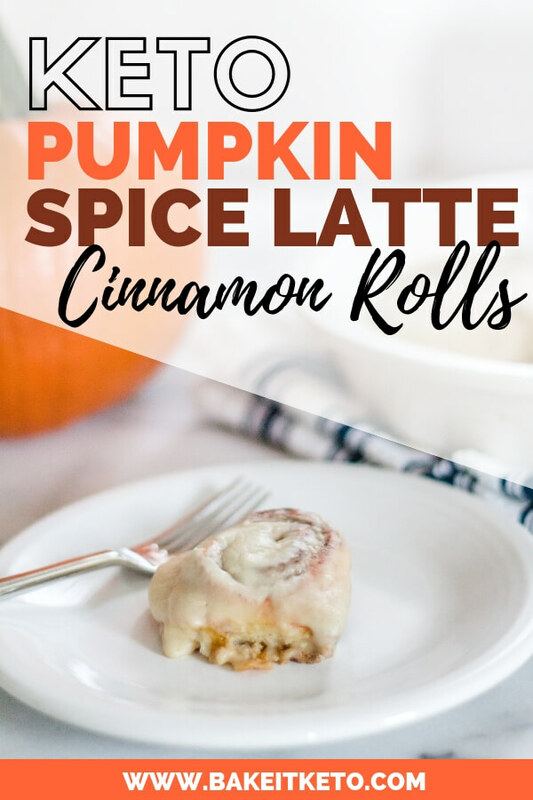 If you’re a Pumpkin Spice Latte lover, this recipe is for you! 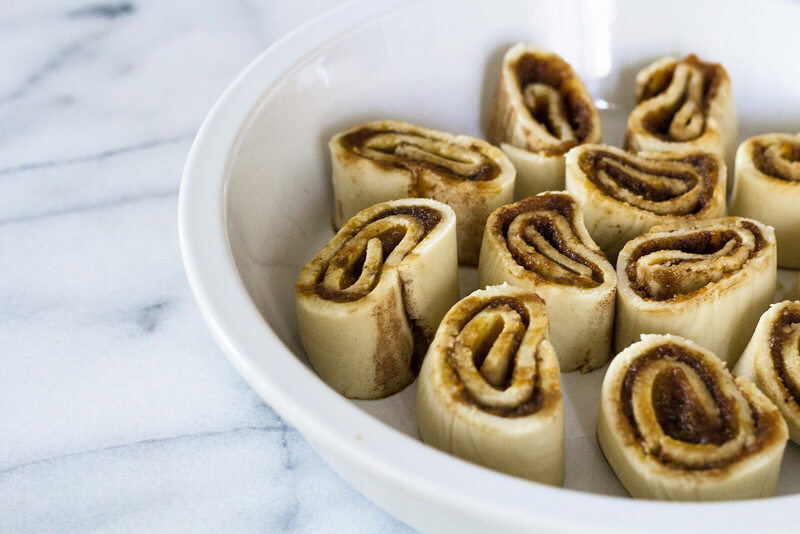 Did you grow up eating Grands cinnamon rolls from a can? Oh man, most of my childhood holiday memories revolve around a pan of those! 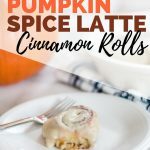 The idea for Keto Pumpkin Spice Latte Cinnamon Rolls has been brewing in my brain ever since I came across a sugary, gluten-filled version from Jessica at The Novice Chef. 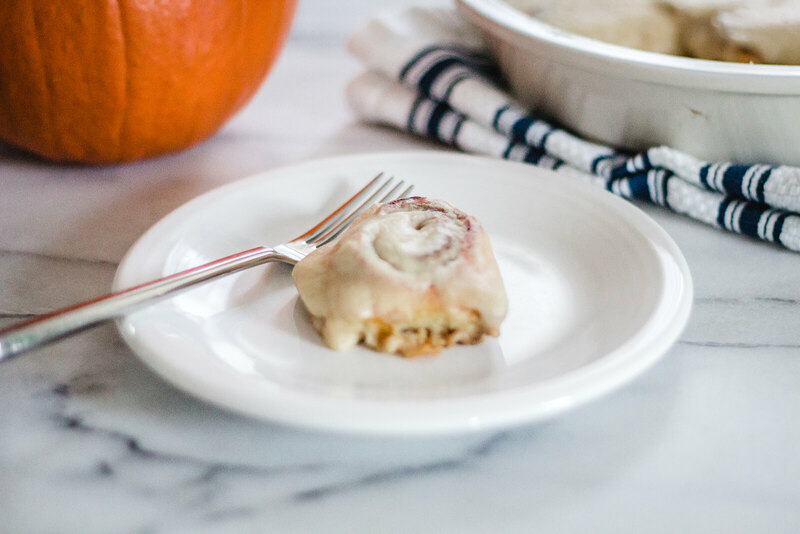 Obviously, a smear of pumpkin puree could only make cinnamon rolls better. Luckily, a small amount of pumpkin puree is easy on my blood sugar. So what about the Latte part of the PSL? I remembered that Ree at The Pioneer Woman makes her famous cinnamon roll icing (again, sugary, although surely delicious) with coffee. How can you possibly go wrong there? CLICK HERE TO DOWNLOAD MY FAVORITE QUICK + HEALTHY KETO MUG CAKE RECIPES! I’ve seen one or two versions of cinnamon rolls using Fathead Dough, But I wanted to go back to the basics and start with my Easier Coconut Flour Fathead Dough as the base. Next, we’ll add a filling of pumpkin, Brown Swerve sweetener, cinnamon, and pumpkin spice. Swerve just recently started making their brown sugar substitute and I’m loving it. It behaves very similarly to the real stuff, and the flavor is perfect for the cinnamon roll filling! Next, we roll up the dough and slice it into individual rolls. Arrange the Keto Pumpkin Spice Cinnamon Rolls in a pie pan and bake. Then top with the coffee icing while they are still warm so it can ooze down into the cracks and crevices! To make the Fathead dough, add the coconut flour, baking powder, and salt to the bowl of your food processor and pulse to combine. Combine the shredded mozzarella and cubed cream cheese in a microwave-safe bowl. Cook 30-second at a time until melted, stirring with a fork at each interval. Add the egg to the food processor bowl and pulse to combine. Then dump in the melted mozzarella /cream cheese mixture and run the food processor until the cheese is completely incorporated. 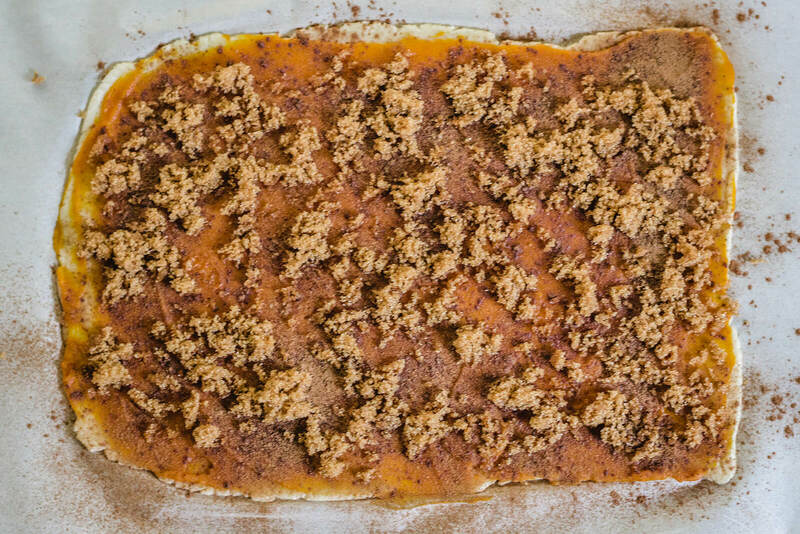 Scrape the Fathead dough out onto a sheet of parchment paper and form it into a ball. Cover with a sheet of plastic wrap (to avoid sticking) and roll the dough out into a rectangle that is roughly 12" x 18". Spread the pumpkin puree evenly over the dough, and sprinkle the brown Swerve over the pumpkin. Generously sprinkle the pumpkin filling with both cinnamon and pumpkin spice. 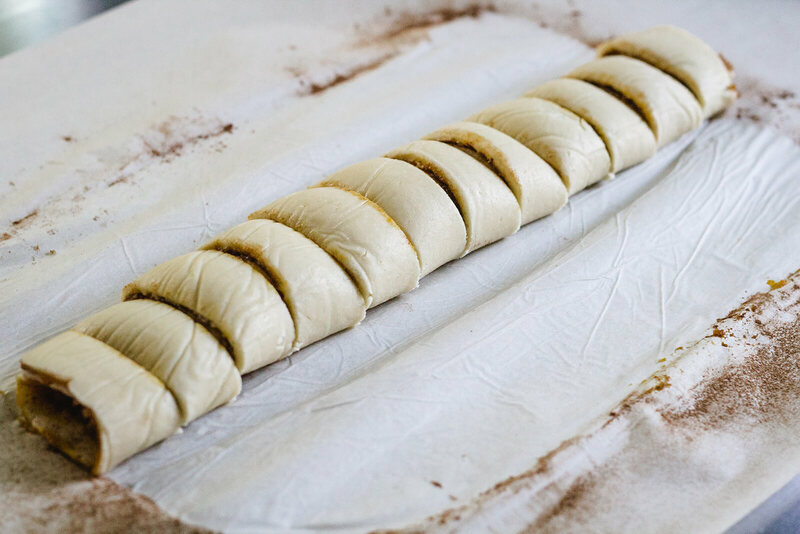 Carefully roll the dough up to form a log and slice into 12 even pieces. Even space the cinnamon rolls in a greased, non-stick pan (I used a 9" pie pan). Bake for 17-20 minutes at 375 degrees F, until cooked through and lightly browned. While the cinnamon rolls are cooking, make the keto coffee icing. Cream together the cream cheese and butter. Add the Confectioners Swerve and beat until combined. One at a time, add the extracts, coffee, and half and half, beating to combine. While the cinnamon rolls are still slightly warm, spread the keto coffee icing over the top. Did you make this recipe?I'd love to see! Tag @BakeItKeto or #bakeitketo! Nutrition facts have been calculated using Cronometer, with the carbs from all erythritol and allulose sweeteners subtracted because I do not personally have to bolus insulin for Swerve, erythritol, or allulose as a Type 1 (autoimmune) Diabetic. All Bake It Keto recipes have been tried and used successfully, but results may vary from person to person. All information provided regarding nutrition on the Website is intended to be used for informational purposes only. I am not a nutritionist. Consult your medical professional before using any recipe if you have concerns about how you may individually react to the use of any particular recipe or ingredient. By voluntarily creating and using any recipe provided here, you assume the risk of any potential injury that may result. Please see my full disclosures at https://www.bakeitketo.com/disclosures-privacy-policy/. 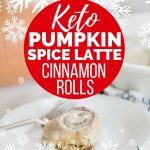 WANT TO SAVE THESE KETO PUMPKIN SPICE CINNAMON ROLLS FOR LATER? CLICK HERE TO PIN THEM TO YOUR FAVORITE KETO PINTEREST BOARD! DOWNLOAD MY FAVORITE QUICK AND HEALTHY KETO MUG CAKE RECIPES! Subscribe below (free) to get the password to download your free eCookbook from the Bake It Keto resource library.